Synopsis Agility can be murder for cats, dogs, and people! Sheila has created a great new who-dunnit, and it is filled with animals! Who doesn't love cats and dogs, and who doesn't love a great mystery, so if that is your niche, then this is the book for you. It is well written and the human characters aren't too bad either. This book will keep you guessing till the very end with and you will feel like you are one a wild ride with all the twists and turns. Drop Dead on Recall , the first in the series, won the Dog Writers Association of America Maxwell Award for Best Fiction Book. She is also the author of 17 nonfiction books, six of which have won major awards from the Dog Writers Association of America and the Cat Writers Association. For the past two decades Boneham has been showing her Australian Shepherds and Labrador Retrievers in various canine sports. She has also bred top-winning Aussies, and founded rescue groups for Aussies and Labs. Boneham holds a doctorate in folklore from Indiana University and resides in Wilmington, N.C. There is a raffle copter giveaway with this tour, just click the link below to enter the rafflecopter. People often ask me and my colleagues where we get our ideas. My answer? Everywhere! Story ideas are all around us in our daily experience, and human beings have been transforming experience into stories since we first learned to speak, both as individuals and as a species. Think of how young children are when they first begin to tell the “stories” of their lives and imaginations! But let me focus for now on the stories I tell in my Animals in Focus mystery series. The big story of each book is purely fiction, but many of the smaller stories that feed the plot are based on real life, recast to serve the book and, in a few cases, to protect the obnoxious, the annoying, the oh-so-guilty! · Experience (my own), revised. I’ve been involved in training and showing animals since I was fifteen—first horses, then dogs. My protagonist, Janet MacPhail, is also a dog—and now cat!—sport enthusiast, so many of Janet’s experiences in the books are based on my own. The details are changed and sometimes multiple experiences are merged into one, but they’re real enough to work for my readers who also play with animals in those venues. Janet’s neighbor and best friend Goldie, and Janet’s mother, are both avid gardeners, and gardening is a hobby dear to my heart. My academic background is in folklore and cultural anthropology, and that shows up in Janet’s beau, Tom, who is an anthropologist. And I grew up in Fort Wayne, Indiana, the setting for the series, so I know the area well. · Anecdotes. I confess, I’m a thief. Every writer I know steals, but mostly just stories and bits of stories. 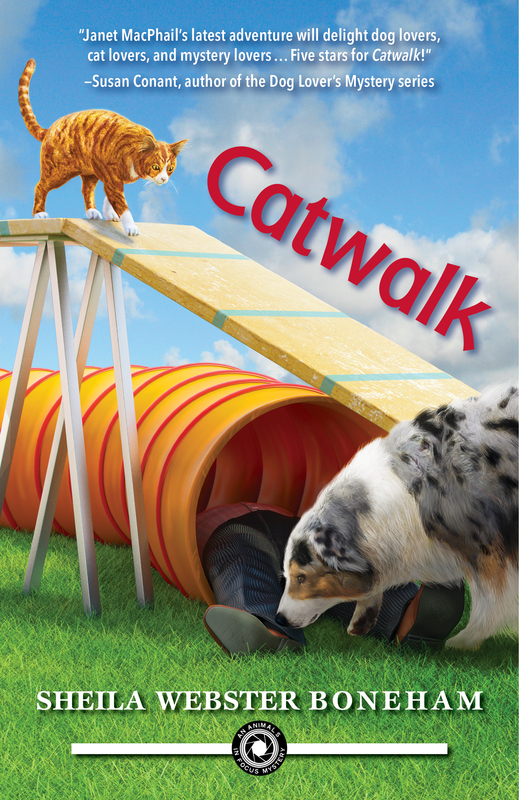 In Catwalk, for instance, there’s a scene with a pair of runaway Malamutes that is based on a story I heard maybe twenty years ago. It’s modified to serve my story, of course, but the idea is based on a rather unfortunate incident that happened to someone else. Don’t worry—no Malamutes are hurt in the making of my book! · Reading (my own). I’m an omnivorous reader, and very often I get ideas from books and articles that I didn’t know would feed my mysteries until much later. In The Money Bird, for instance, illegal trafficking in tropical birds is a critical issue, and that idea came from reading many articles on the subject, and one particular book--Spix's Macaw: The Race to Save the World's Rarest Bird by Tony Juniper. In the series, Janet chose the nursing home where her mother resides in part because of its garden therapy program, and that idea grew out of an article I read on therapy gardens. Sometimes the written sources are fortuitous finds; sometimes they are books and articles I’ve ferreted out as I research a subject. Whatever works! · Reading (sent my friends & readers). Once in a while someone sends me something that ends up in a book. It may something they thought would interested me because of my mystery series, or something quite random. In Catwalk, one of the story lines has to do with “morality police” in the nursing home where Janet’s mother lives. That came from an article my friend Linda Coleman sent me about people interfering with elderly people’s love lives in nursing homes. The idea that anyone would deny another person companionship and love in their final years was so appalling to me that I knew it had to be in a book. That’s probably not an exhaustive list, but those sources do cover a lot plots and scenes and characters in the books. As I write the next book in the series, I have asked for anecdotes from readers on Facebook, and a couple of the funniest are in the manuscript. If you’re inclined to follow me there, maybe you’re story will be next! Thanks for having me here, Melina! This book sounds like a lot of fun. I agree with Sheila. I also draw inspiration from personal experience, reading and the stories other people tell me. Sometimes stories I hear inspire only one scene, but others drive whole plotlines. Stories from relatives, friends, co-workers and even my hairstylist contributed to my current book, Dog Dreamzzz. I love Sheila's idea about mining Facebook for more stories. PS - Love Sheila's books.